I reported to Amazon on Saturday 10/19 for orientation. I have been through this twice before so I am familiar with the procedure. Saw some of the same movies I had seen before, but portions of it had been updated. In the afternoon it was off to Safety School. Then we got off work at 5:30. I headed straight home and Chica was right their to greet me. It had been a long day for her as well and she was very excited to see me. Sunday is the first day of my shift and I work through Wednesday. They start us right out on 10 hour days from 7:00am to 5:30pm. The first week they gave us a break and Monday and Tuesday we only worked 5 hours. This year they made me a Stower. I get the products from receiving and stow it in the bins. It will be much less walking then last year when I was a picker and picked the items out of the bins. Pickers usually walk between 12 – 14 miles per day. However a stower does not walk nearly as much, as we can put the items in any bin that has space. It is a bit difficult this time of the year for a stower as the bins are very full and sometimes difficult to find some open space. However, once the customers start their Holiday shopping everything will change and I will have lots of open bins to stow the merchandise. Your find out the muscles you don’t normally use as much as usual. I take two Aleve in the morning and it cures the soreness most of the day. I have done that every year I have worked at Amazon and believe me it really works. This is the third year I have worked at the Fernley, NV Fulfillment Center. I have had different jobs each year. The first year I was a Packer, the second year I was a Picker and this year I am a Stower. They always ask you to specify what job you would prefer, but I don’t think they pay much attention to it as each year I have had different jobs then what I stated that I preferred. Oh well, it is nice to be able to do other jobs as well. After going on my third year I am familiar with the layout of the building. It is a massive building and finding your way around it can be very difficult for new people. Most of them get very stressed out not even knowing where all the bathrooms and break rooms are let alone the many different production lines and storage areas. 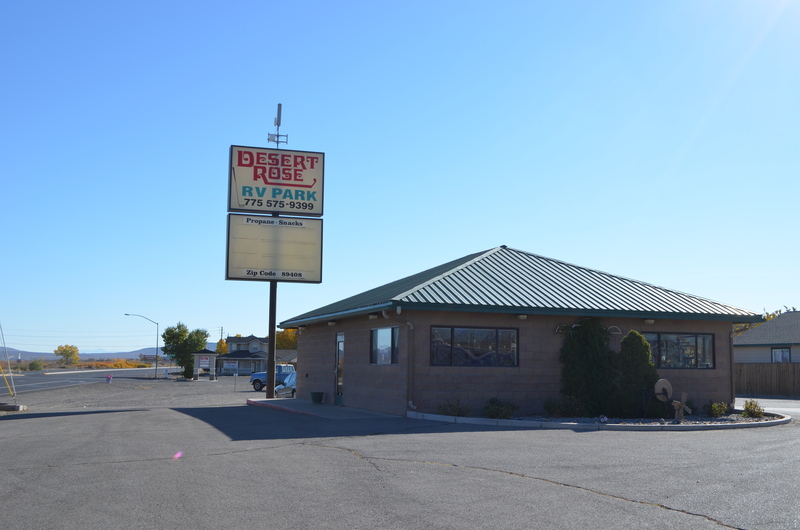 My home this year as it was the past 2 years is the Desert Rose RV Park. This year I have the same space as I did last year as I was able to reserve it when I departed last year. Here I am in good ‘ole space #140. It is close to the front and the office. A few things have changed since my last season at Amazon. I now have a vehicle and satellite TV. Both of those were thanks to the money I made last year working. Another thing that has changed is Chica. She and I have been together since February 25. It has now been 8 months and 8,658 miles since we have been so lucky to meet each other. She is is her favorite spot on the couch with the sun coming through the window. She also likes to get on top of the nice warm clothes after I bring them back from the laundromat. She loves to crawl under them and go to sleep. 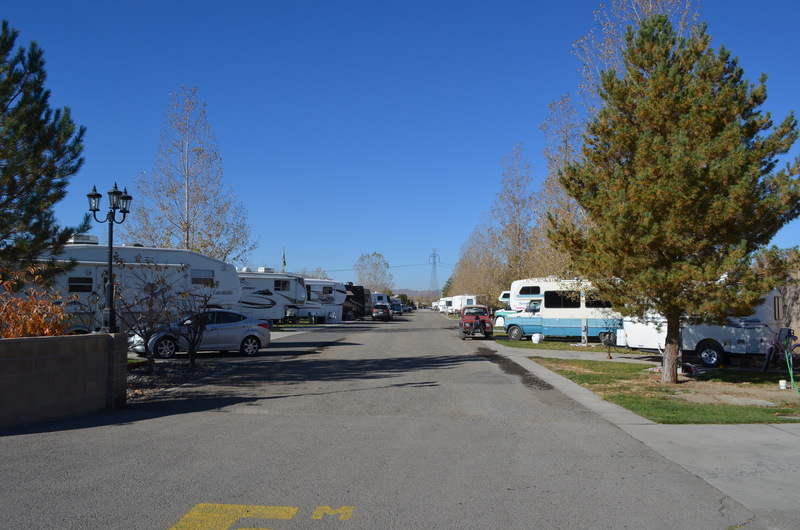 This year I have many friends both here at the RV Park and Amazon as well. I have run into many of the same people that I knew last year. I encouraged some of my friends at Quartzsite to work here this year. However, they all have different shifts so I don’t see them too often. The weather during the day is really nice in the low 70’s but gets down into the low 30’s at night. I keep my catalytic heater going all night and turn on my furnace in the morning for a cycle just to warm up. However it is forecast to go down into the low 20’s next week at night. BRRRRRRRRR! I also have a small electric heater I will run once it gets really cold. I also have a dog walker that I pay $5 per walk to come and walk Chica on the days when I am working. There is another person in the park that cooks really great meals and I can schedule them on a couple of my days off. YUUUUUUM! After 10 hours of work on your feet you don’t really feel like cooking. I cannot post every day but will try to post as much as I can on my days off. 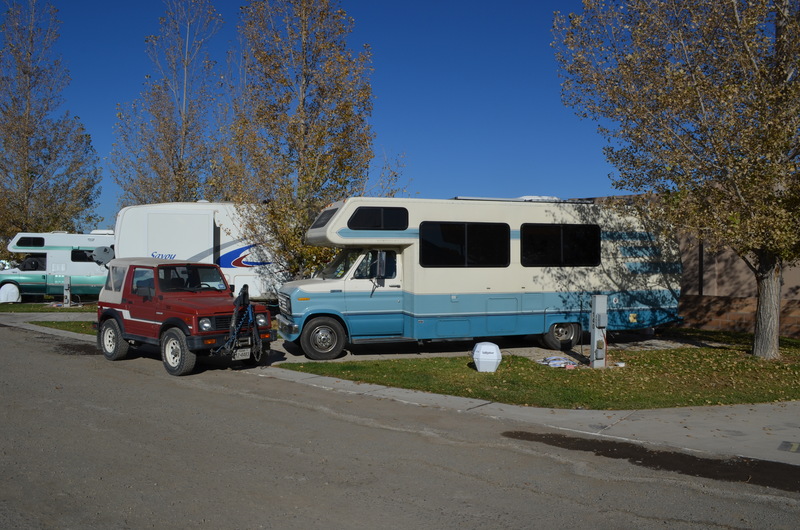 This entry was posted in Amazon, Amazon, Desert Rose RV Park, Fernley, Friends, Nevada, Workamping and tagged Amazon, Amazon workkamping, Chica, Friends by Jim Melvin. Bookmark the permalink. Sounds like it’s really working out to do this to make some extra $$ every year. Good to hear from you. Say hi to Roger. You must like the Amazon work to be there for your third year! Chica is going to be mighty spoiled. Not every princess has a dog walker! It’s not the work I like but the money. Chica is already very spoiled. So you just find an empty spot, put your stuff in it & scan the spot? That’s neat, maybe better than having the computer tell you where to put it. Does the dog walker and the meal person work to Amazon too? Neither the dog walker or the chef work for Amazon. 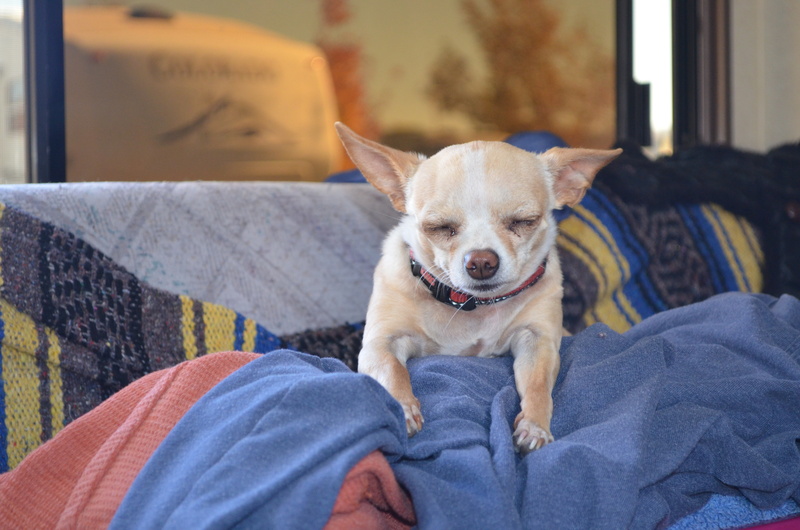 The dog walker also works for the RV Park and I believe the chef’s husband works for Amazon. Have you bought Chica girl who own electric heated pad yet? I think she might give you back your warm clean clothes if she had one. Give her a warm hug for me. Waiting for my first check to order one. She stays warm so far with these nice days and the heat running at night. Glad to see you’re all settled in. That’s a nice park. Never thought of someone in the park doing dog walking – that’s a great idea. And to have someone that makes meals is a great service too. I think I’d rather do those jobs than work at Amazon LOL!! Looks like David and Nola in the LD just down the way from you there, Jim. Say “Hi” to them for me when you see them next time. We really liked our stay at the Desert Rose, but then, we didn’t have to do what you are doing at Amazon. Sounds like your current position will be a bit easier on your shoes this year. Chica looks nice and toasty in those warm clothes! 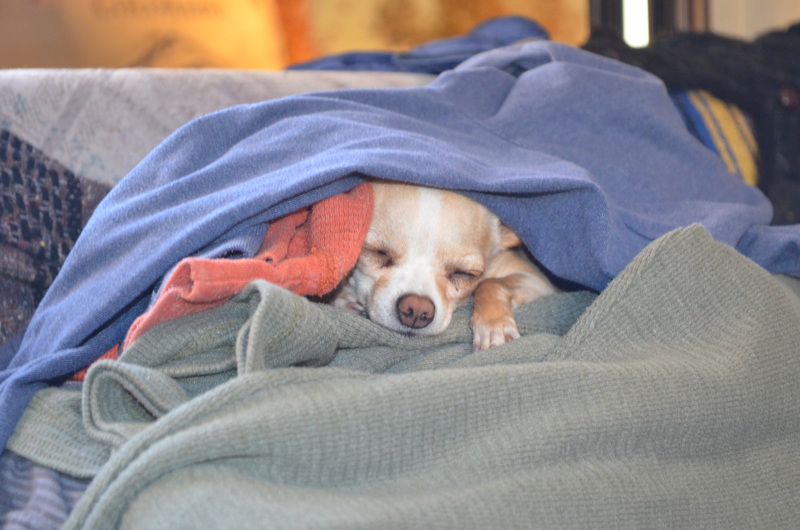 Love the photos of Chica on the dryer warmed clothes. Her face says “bliss!”. Very interesting hearing how the Amazon warehouse is set up. I read they have crews in, was it P&G or Kimberly Clark? To pack and ship items direct from the factory. 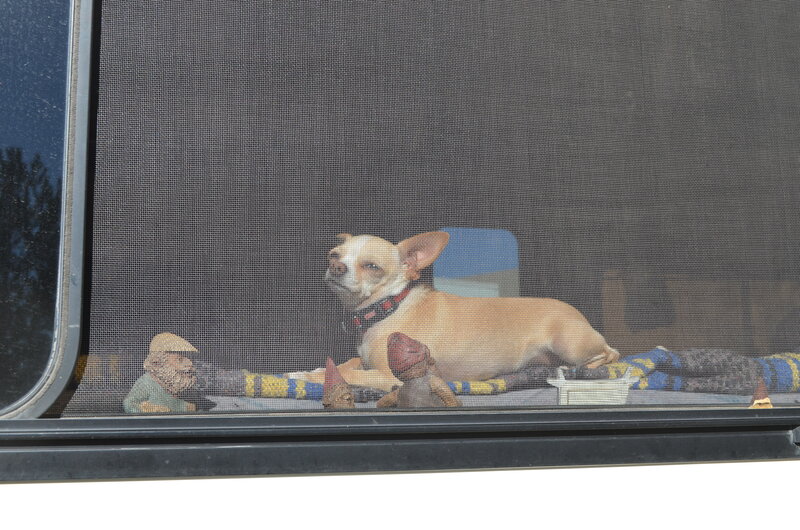 Glad things are going well for you and Chica. I have to admire you Amazon workers – after so many months of not working it’s got to be hard to jump right in and work so many hours a day.